Add up the total number of valence electrons found in the entire compound. Don’t forget to include any positive or negative charges when determining this. Draw the simple structure (skeleton structure) of the compound by connecting everything with single bonds only. Add electrons to all the noncentral atoms. Note that most atoms want eight total electrons, so atoms that have only one bond will each need to receive six electrons. However, hydrogen wants only two electrons; each bond counts as two shared electrons, so don’t add any electrons to hydrogen. Put any unused electrons on the central atom. If all atoms (except hydrogen) now have eight electrons, you’re done. If one or more atoms do not have eight electrons, you must form double or triple bonds between them. Keep in mind that each bond counts for two shared electrons. If all atoms now have eight electrons around them, you’re done. 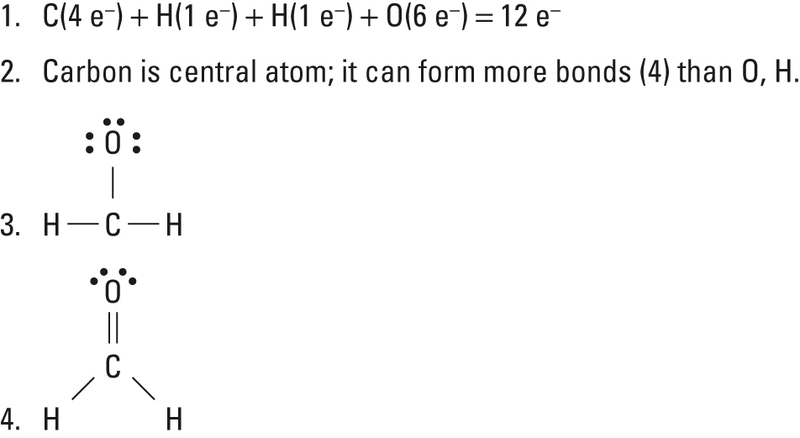 If you have valence electrons left over, add them to the central atom, even if it violates the octet rule.